Inspectioneering recently had the opportunity to sit down and chat with Cary Forgeron and Samuel Fisher about the importance of oil analysis to effectively managing the reliability of rotating equipment used in the the O&G and other processing industries. Mr. Forgeron is a Certified Lubrication Specialist and Mr. Fisher is the Global Director of Oil Condition Monitoring with Bureau Veritas. Historically, we have focused our attention on techniques and best practices for managing fixed equipment mechanical integrity (FEMI); however, rotating equipment is an integral part of most operations and must be maintained as well. We hope you find the exchange as interesting and informative as we did. How can oil analysis be used to effectively manage asset reliability? There is no question that an effective oil analysis program lowers maintenance costs on rotating equipment. The trick is figuring out how to run an effective oil analysis program to maximize that value and extend the life of equipmentyou’re your managing your oil analysis program by checking to see if the reports have red, yellow, or green flags and then taking the recommended actions, you are losing a lot of the technology’s value. The overall structure of an oil analysis program should be based on maintenance and reliability goals. These goals should guide the asset managers through the process of designing and implementing the program. Sample frequency and testing should be based on the equipment type, as well as its criticality to plant production and environmental conditions under which the equipment operates. By sampling equipment on a routine basis, a baseline of normal wear is established and can help indicate when abnormal wear or contamination is occurring within the equipment. In many cases, this enables identification of potential problems before a major repair is necessary and allows the plant managers to time schedule maintenance instead of the machine scheduling it for them. How can asset managers rely on tribology (oil analysis) to extend the lifecycle of rotating equipment? Predictive maintenance (PdM) continues to show up prominently in literature and at technical conferences as the strategic direction in asset maintenance and reliability. It is important for plant and asset managers to understand PdM and how tribology and lubrication management fit into this larger maintenance strategy. Machine Wear: An unhealthy machine generates wear particles at an exponential rate. The detection and analysis of these particles assist in making critical maintenance decisions. Machine failure due to worn out components can be avoided. Contaminants: Increased contaminants from the surrounding environment in the form of dirt, water and process contamination are the leading cause of machine degradation and failure. Increased contamination indicates it is time to take action in order to save the oil and avoid unnecessary machine wear. Lubricant Condition: The assessment of the lubricant condition reveals whether the system fluid is healthy and fit for continued service or if it should be changed or sweetened. It is essential for asset managers to understand these capabilities of oil analysis in order to take full advantage of it. Oil analysis has proved to be a very effective method for maintenance scheduling and oil drain interval extension. Perhaps more important is the effectiveness with which oil analysis can identify machine failures and in some cases, oil analysis provides the very earliest warning of trouble. Used properly as part of maintenance strategy, oil analysis offers an inexpensive way to reduce the inherent failure rate of mechanical systems. What is the correlation between in-service oil analysis data management and preventative asset integrity? While oil analysis has become an integral part of most plants’ maintenance programs, the success of any oil analysis program and its ability to provide vital information to the maintenance team is still critically dependent on how well the oil analysis data is managed. If the data is managed efficiently and effectively, it can provide invaluable information to everyone involved in the asset management chain. Asset integrity, like everything else, is now benefiting from “Big Data” tools. Software programs and technologies are allowing asset managers to link multiple sources of data together to better understand the “big picture.” By combining the data generated from oil analysis with other predictive maintenance technologies, and tying them in with the facility’s asset management systems, plants are leveraging efficiencies to draw more value out of existing programs and practices. What oil analysis tools are available today to assist asset managers? There are literally hundreds of oil analysis tests out there. Trying to determine the correct test slate for an oil-lubricated piece of machinery can be daunting. 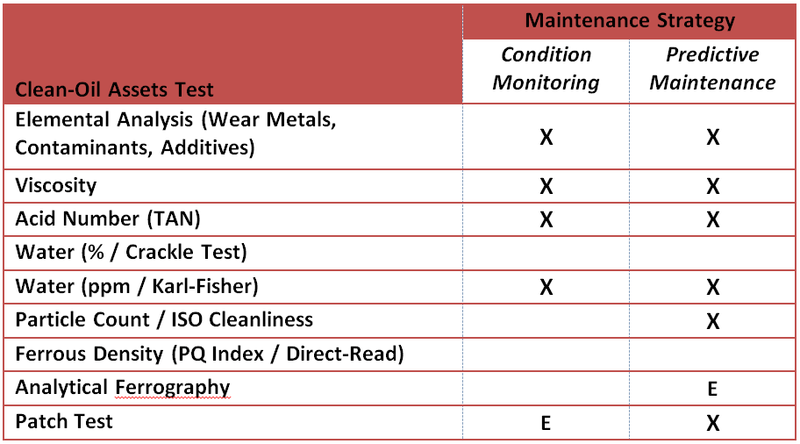 There are so many tests available, some appropriate for the machine or lubricant, others not. Having an idea about what the various tests are, what they can accomplish, and taking into account the maintenance philosophy being practiced, test slates can easily be drawn up to accomplish the desired results. The most encountered industrial asset classes monitored are: gearboxes and clean-oil systems (hydraulics, compressors, turbines, etc.). The test slates below represent common tests performed of these two classes of assets. It is worth noting that test packages can be purchased from most laboratories at a price substantially cheaper than the sum of the individual tests purchased separately. “E” indicates exception testing to be performed on an as needed basis. performed, “E” indicates exception testing to be performed on an as needed basis. What are some examples of how oil analysis was deployed to help improve asset reliability? On a recent sample, the silver content from one of the engines increased from 0.1 ppm to 0.2 ppm. A laboratory data analyst contacted plant personnel to report the increase and discuss the situation. They decided to halve the sampling frequency for this unit. Subsequent samples showed a steady increase in the reported silver, peaking at 0.6 ppm. Operating experience was reviewed at the plant and two sister plants that had experienced similar circumstances. An inspection was performed, and silver coated bearing material was identified in the engine crankcase sump below the affected powerpack. The silver had been displaced from the wristpin bearing surfaces to the carrier bearing surfaces, blocking one of the lubricating oil channels. The partially blocked oil channel prevented normal oil flow at the bearing-to-wristpin interface. Over time this would have led to base metal-to-base metal contact, potentially causing a catastrophic bearing failure and critical engine damage. If oil analysis had not identified the onset of the wear and if the maintenance personnel had not reacted appropriately, the machine would have failed. Because the accelerated wear was identified by a $35 sample analysis and acted upon early, only minor repairs were required at a cost of $12,000. Conversely, the typical repair cost for a single powerpack is approximately $160,000. The estimated cost of a catastrophic failure of the engine would have been roughly $950,000, when expenses and lost revenue are taken into account.